Love looking at renderings of upcoming developments in the city? Click here for our full archive. Renderings courtesy of Rapt Studio and James Cornfield Field Operations. After plans were revealed in March of 2016 for the $100M renovation of the San Pedro’s famed, 30-acre waterfront area known as Ports O’ Call, not many were impressed—including the large portion of Long Beach fisherman and sailors who bounce back and forth between Ports O’ Call and Long Beach. The proposals were theme park-y, kitschy, and looking more like Disney California Adventure than a new market. In other words, they were trying to clean up—with much too much sterility—what had become a dingy den of happiness for most visitors, a dirty rite of passage for SoCal denizens. And the lack of enthusiasm forced design teams back to the drawing boards by way of public opinion. The unveiling revealed stark contrasts to initial proposals, entirely eschewing an homage to the area’s nautical past and instead, aiming for a glass-and-metal look with large, steel A-frames that encase massive expanses of retail and restaurant space. Fisherman’s Park [rendering right], a three-acre pedestrian promenade that includes trails, bicycle paths, water features, and more. An open-air amphitheater to be operated by Nederlander Concerts, the music giant that heads up some of LA’s stellar venues, including the El Rey, the Greek, and the Forum. The possible moving of the USS Iowa away from its northern docking slip and into the market space, acting as a direct attraction while also freeing up its former space for to attract another cruise line. The possible incorporation of the famed Red Trolley depending on the initial economic performance of the market. 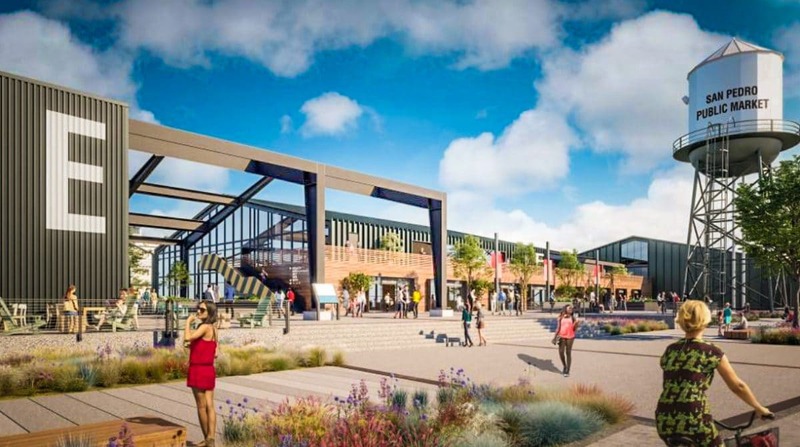 As far as tenants go, the sole original tenant will be the San Pedro Fish Market, which will remain open during construction of the Public Market as well as opening a second location in Alamitos Bay in Long Beach. New tenants could not be immediately unveiled given the newness of the project, but one staple tenant will be a new restaurant by Chef Dustin J. Trani, whose family has owned and operated the 90-year-old J. Trani’s establishment in San Pedro. A completion date of 2021 was set at the talk as demolition of the Ports O’ Call continues this year. According to Urbanize.LA, construction of the first half of the market itself is tentatively scheduled to begin in July 2019, with an opening date targeted in either late 2020 or early 2021. The second phase of the project would break ground in early 2021, with completion anticipated later that year or early in 2022.